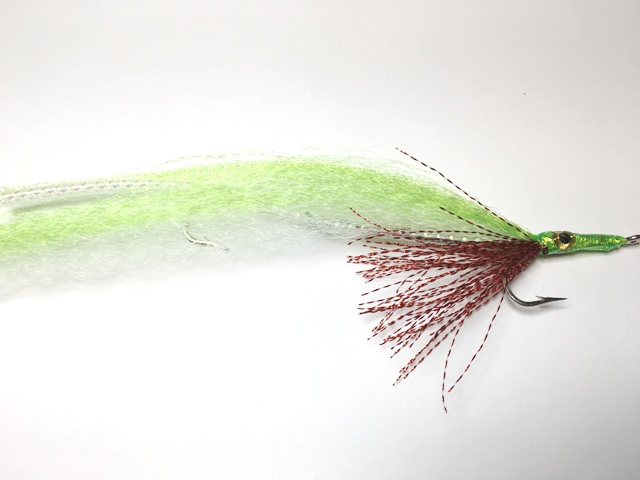 The Andros Island Needlefish Fly is a durable Tandem Center Hooked Barracuda fly that is tied with a long synthetic material wing and a colorful red thread head with eyes. The thread wraps are covered in durable epoxy. Available in a variety of colors. A Barracuda generally bites their prey in half, so a center hooked cuda fly is a big advantage and increases your hookup ratio. See this blog entry at flyfishman.com where the writer links to a Merrimack River Flies Cuda Fly as an example.